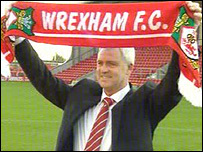 Wrexham unveiled Brian Little as their new manager on Thursday. The 53-year-old former Aston Villa, Leicester and Tranmere boss takes the reins from Brian Carey who will remain at the club to work alongside Little. Steve Weaver, Joey Jones and Andy O'Boyle retain their current places on the backroom coaching staff. Little's contract runs initially until the end of the season, with his task to save the struggling Dragons from relegation from the Football League. Wrexham are currently on a six-game winless streak that has seen them drop to second bottom in League Two and bow meekly out of the FA Cup. "I'm delighted to be joining Wrexham," Little told the club's official website. "I think the most important thing is to sort out the team's position in the league. Then and only then can you look to the future." There had been speculation that Carey would remain at the Racecourse Ground in some capacity. He succeeded Denis Smith back in January, the former Wrexham captain stepping up from the backroom staff into his first managerial appointment. Despite helping stave off the threat of relegation last season Carey has struggled to find any level of consistency this term. But Little signed Carey as a player during his time in charge of the Foxes and confirmed they would be working closely together. "I know Brian Carey well and trust him because I signed him at Leicester," Little said. "At the moment we need to get the club away from the bottom of the table, whether that takes a month or three months and once we do that we can look at other targets. "The current position is not one where you can say that someone new can come in and we'll start flying up the league. "It might take a little time and maybe it will be a long hard season, but we've got to have a focus on trying to get away from the bottom of the table. "If that isn't the case straight away then we'll have to focus on retaining our league status. Those will have to be my initial aims. "Some people are full of false promises early doors, but there has to be a realisation that the team are in a bad position. "This is something I've inherited before at other clubs and it's something I think I've got experience in. "The important thing is not to kid anybody and to stay focused but to pick up points steadily and move away from danger." Little has been out of work since leaving Tranmere by mutual consent in May 2006 after three seasons in charge. Carey's position as manager had been under threat from some weeks after a poor start to the season. The Dragons managed just three wins from 14 league games this season - scoring just three goals at home - leaving them in the League Two relegation zone. Carey's overall record since succeeding former boss Smith last January also makes poor reading, with only nine wins from 41 games. Only a win on the final day of last season prevented Wrexham from losing their Football League status. Wrexham announced last week they intended to bring in a more experienced figure to take charge, and chairman Neville Dickens believes Little fits the bill perfectly. "He has a vast amount of experience. He's been at the highest level, he's been down in the lower leagues as well and he's left his mark wherever he's been," Dickens said. "Those fellows are rare and you're not able to get them very often, they are not about." Dickens said Carey had "done everything we asked of him" during his 10 months in charge, and praised his work in developing Wrexham's youngsters. But he said the club's plight at the bottom of the league meant changes had to be made.